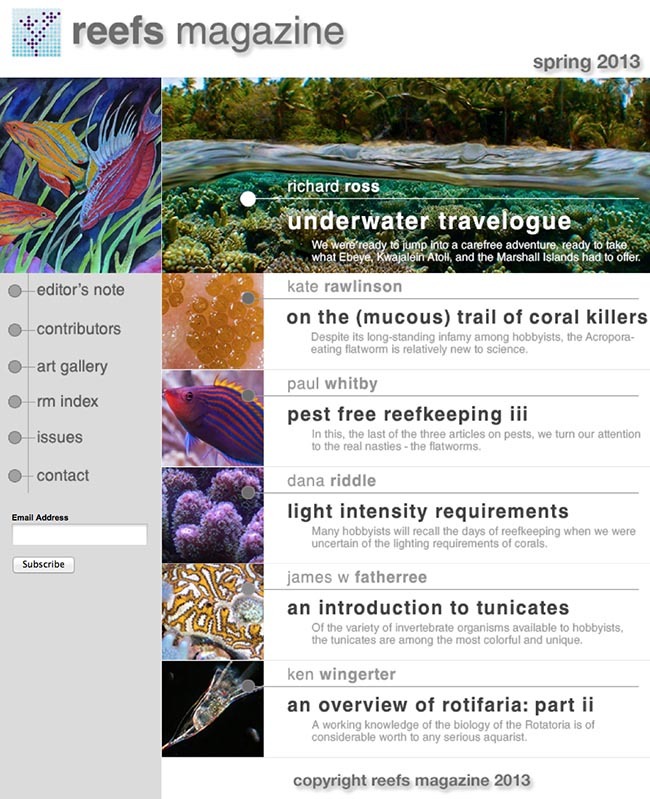 Hot off the cyber-presses, the Spring issue of Reefs Magazine is now live! The new issue is filled with thought provoking content from both new and familiar voices. Rich Ross steps away from his usual role as resident reef skeptic to take us along on his impromptu adventure to Kwajalein Atoll in the Marshall Islands. It is a fascinating account of a remote and unique place that few every get to see. Hobby mainstay Dana Riddle presents real-world light intensity data from the shallow tide pools of Hawai’i. The conclusions he draws might surprise you. Acropora eating flatworms (AEFW) and other reef pests take center stage in complimentary articles by Dr. Kate Rawlinson (the first to scientifically describe the problematic nasties) and Paul Whitby who focuses on how to detect and control an unfortunate infestation in an a captive system. James Fatherree introduces us to the beautiful and fascinating world of our most distant relatives-the Tunicates, and finally, Ken Wingerter finishes up his detailed examination of the various species and habits of rotifers. As a special bonus please check out the Art Gallery where we are featuring the fantastic aquarium themed work of Nate Wilson. Enjoy!